I really needed a French cuisine reboot. After a boring, taste-deficient (unless you really like fish), allegedly ‘French-inspired’ dinner at Cluny (read the review here), I was craving a place that would reaffirm my faith in Toronto's French cooking abilities. I found it again in Batifole. The restaurant was first suggested to me about ten years ago. But at that time, my dinner companion and I chose to go the amazing, but now closed, Pastis Express. 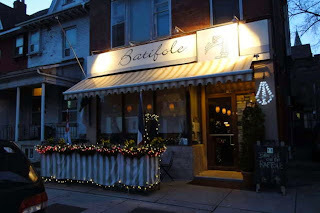 Despite that restaurant re-route, Batifole remained at the back of my mind. In the restaurant game, sometimes longevity can work against you. You could be fresh and a big hit one year, and stale and tired the next. It's comforting to know that in 2015, the opportunity to visit Batifole remained, and that its reputation as an incredible place for cuisine française was still intact. Batifole is the exact opposite of Cluny in almost every way. It is not a glamourous restaurant. One blink and you'd miss it if you were looking for it. The neighbourhood where the restaurant is located is not gentrified, nor is it up and coming. Yet the restaurant has remained in that same location - successfully, for over ten years. You'll soon learn why. When my dinner companions, THG and the lovely Tracy T., and I arrived (and I'll add that we arrived early), our table wasn't ready. The friendly hostess told us it would not be ready for about 20 minutes. That gave me the chance to just observe the restaurant, the staff and its patrons. It's definitely not over the top in regards to its decor. It's simple, functional, a bit dark but it all works and lends itself to the overall atmosphere. This is a place where you are coming to eat, whether it's alone, with friends or a partner, and not to be wowed or distracted by the scenery. The restaurant was absolutely packed with people at tables and at the bar, noshing, talking, relaxing - well, maybe not the staff who were definitely working hard that night. There was also a steady stream of people coming in - without reservations (overheard by me), to see if there was space for them (there wasn't). I haven't even eaten a morsel, yet once again I knew I was in for true gourmand experience if people were popping in just to see if they could snag a spare table. When we were seated, a round of Kir Royales were presented to us. It was a token of thanks for our patience while we waited for our table. I know. We were thrilled. I mean c'mon, we were the early ones so there wasn’t a need for the restaurant to do anything other than show us to our table. But they gave us champagne, and trust me; the gesture will never be forgotten. After we were comfortably seated, our waiter told us the house specials and we didn't take long to give him our orders. It was time to eat. As befitting Chef and owner Pascal Geffroy's background, the cuisine would be Provence based. To start, my dinner companions both ordered the shrimp with pernod, tomato concasse and a celeriac remoulade. I ordered the Melange de Terrine Maison - or the house terrine with fresh bread, pickles and this incredibly delicious onion jam, which was made from a reduced cherry syrup. It sounds sweet and it was, but oh my God, just so tasty with the terrine. I personally want to know where the restaurant orders its bread. I should have asked. I sense Thuet. I do love a good French baguette, but who doesn't? Warm, crusty bread, dripping with butter? Is your mouth watering? Good. Our appetizers were paired with a French chardonnay. It was time for the entrees. Now I confess to being a duck confit addict. Whenever I go to a French restaurant or bistro, I immediately look for it on the menu and order it - no hesitation. I couldn't at Cluny because it wasn't on the menu. I know, I was surprised too. I mean you're serving French cuisine and yet you don't have duck confit on the menu? What? But I digress (Edit – is my dislike of Cluny becoming too obvious?). One of my dinner companions, Tracy T. is a confit lover too, so we both ordered le duo de Canard, Cuisse Confite et Magret Rotie, Calvados et pomme de l’aire Confites - or duck made two ways: a confit leg & a pan seared breast with calvados sauce and apple confit. She paired hers dinner with a salad, I had the Gratin Dauphinois - potato gratin. A very, very rich, creamy, garlic based potato gratin. I took one bite of the confit and sank into my chair. I know that feeling. I crave that feeling. You know what I mean, the feeling of culinary satisfaction. I hoped for that with my confit and I got it that evening. Crispy, crackling duck skin. The dark duck meat was tender and juicy. Parfait. My other dinner companion, THG, ordered the Pave de Steak Poele Sauce Borelaise et Echalotes confites - or pan seared flat iron steak with a bordelaise sauce and a shallot confit. He paired his main with frites. So basically what he ordered was the French cuisine classic, steak-frites. What can you say about a perfectly cooked, medium rare juicy steak served with house fries that are hot, crispy (you just know it was fried in duck fat - mmmm!) and expertly salted. I will suggest that when you visit Batifole - and you will, should you order a side, it's probably best for your waistline to share it because the portions are quite generous. All our mains were paired with a French Bordeaux as suggested by our knowledgeable waiter. The wine was medium blend, not too heavy, not too light, so it provided a nice balance when paired with both the duck and the beef. We were a very, very happy, probably drunk, but definitely full table when it came time for dessert, so we had to say no. A shame really. I think we may have missed out on what I'm sure was amazing Gateau au Chocolat and the classic, Creme Brûlée. That was alright, because we received an even better treat than dessert, with the opportunity to personally meet Chef Geffroy. He came out of the kitchen to greet and talk with some of the patrons. Besides the incredible cuisine and service, it was Chefs personal visit to our table that puts this restaurant on my personal list of top restaurant picks and favourites for 2015. Knowing how busy he was working in the back with the rest of his team. To take the time to personally chat with us, sharing a few stories about his recent trip to Provence, provides that extra touch that means so much. At least for me it does. Oh yes, I will be back.